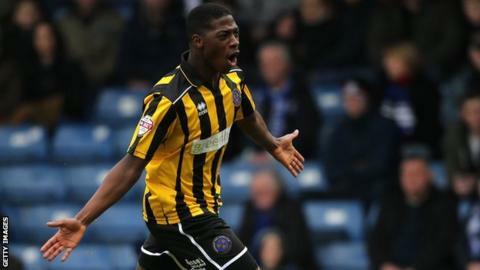 Stand-in captain Abu Ogogo says in-form striker Sullay Kaikai will play a key role in Shrewsbury Town's bid to avoid relegation from League One. Kaikai, 20, is back with Town for a second spell from Premier League Crystal Palace and has scored six goals in his last five appearances to lift the club two points clear of trouble. "He's very important for us," Ogogo, 26, told BBC Radio Shropshire. "He's got the quality and can score goals out of nothing." Kaikai, who scored on his only appearances to date for Palace in their League Cup tie against Newcastle in September 2014, first moved to Greenhous Meadow last September and scored five times in 17 games before returning to Selhurst Park at the start of January. Since coming back to Shropshire the goals have flowed, leading Shrewsbury boss Micky Mellon to question why he has not been part of the England Under-21 squad. Ogogo, who is wearing the armband in the absence of suspended Nat Knight-Percival, thinks Kaikai has improved since he was last at the club. "He's always played well but he's now adding goals to his game," said Ogogo. Kaikai's 11th strike of the season put Town ahead league leaders against Wigan last Saturday before the title challengers hit back in style to win 5-1. But Ogogo is staying confident over their survival chances despite having to play four sides currently in the top six in their next five games. "One defeat in 10 games isn't bad - we've been on a good run so we need to dust ourselves down and go again," said Ogogo. "We've got a tough run-in bit we can't look at other teams."